At this year’s annual Automattic all-company Grand Meetup, the four-minute flash talk I gave my colleagues was a crash course in growing garlic. 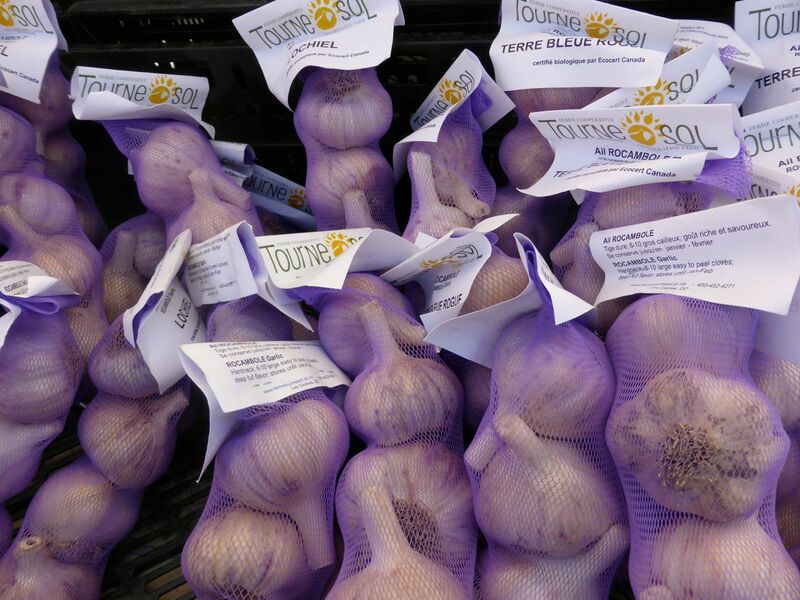 The tips on garlic-growing were gleaned from a workshop by farmer Dan Brisebois, one of the organizers of the Ste-Anne-de-Bellevue Garlic Festival. Some of the specifics are geared to climates like mine – plant hardiness zone 5a – where the ground freezes during the winter. I readily admit that I’m far from a gardening expert. I’m also a lazy gardener who can never remember to water what needs to be watered, trim back what needs trimming back, or otherwise pay close attention to my poor little garden. I’ve also discovered that local squirrels very much enjoy consuming the fruits of our garden labours, without even so much as a thank-you, or note of appreciation. The good news? Garlic. It’s easy to plant, requires almost no maintenance, and the squirrels could care less about it. Plant your garlic in the late fall, as you would with flower bulbs like tulips. I usually plant mine in late October. 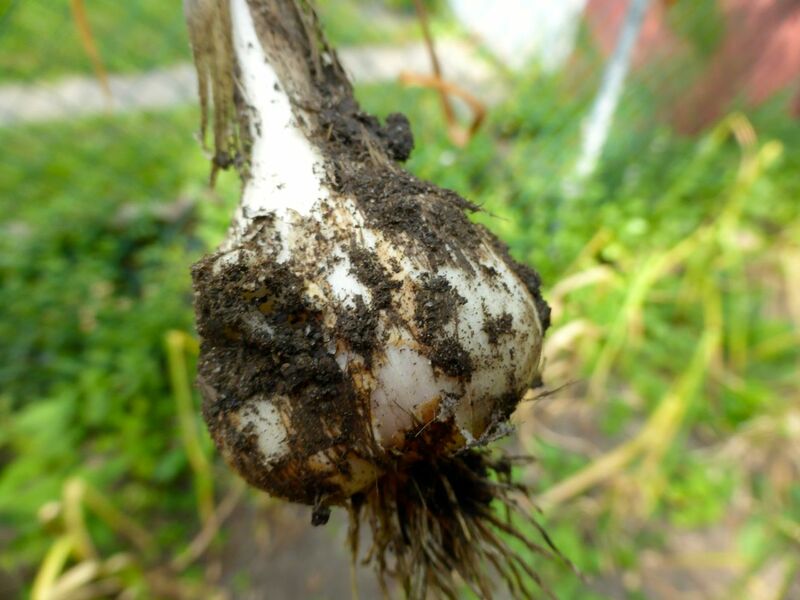 Garlic needs to grow in well-drained, sandy or clay soil. It doesn’t like to sit in wet soil. You can add some compost or composted manure to your soil before planting. 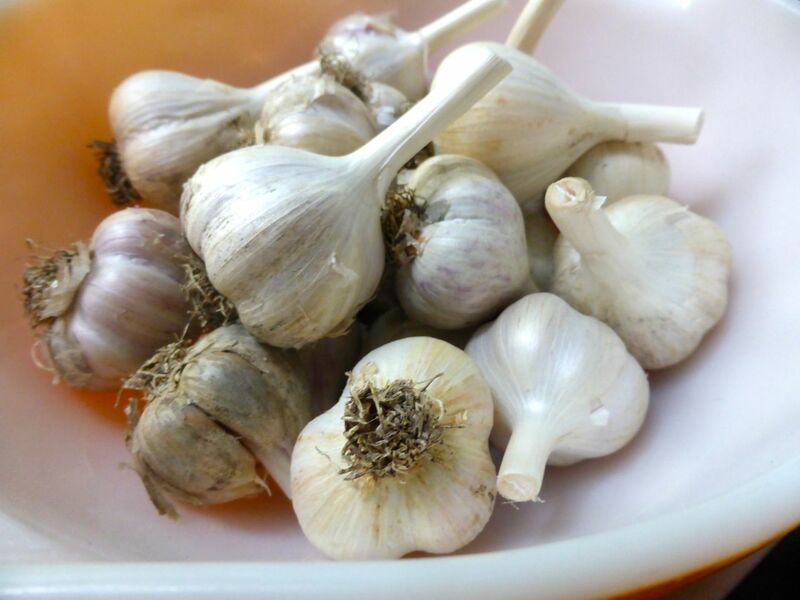 Get some good garlic with large – but not gigantic – cloves and split them up. Make sure each clove still has a little of the “basal plate” attached, which is where the roots will grow. Dig small holes about 2-4 inches deep and place one clove in each hole. Plant smaller cloves shallower, larger cloves deeper. Space your plantings in rows 4-6 inches apart, root-side down. Leave 12-15 inches between rows. Plant in full sun. Cover the soil with a thick layer of dead leaves, hay, or even cardboard. Do not use cedar mulch, as it’s too acidic. Mulching helps keep the ground fully frozen throughout the winter so the bulbs survive and don’t rot. Rotate your garlic – don’t grow it in the same spot every year. Dan recommended ideally reusing the same plot only after 4-5 years. By mid-spring, you should see green shoots starting to poke up out of the ground, through your mulch. If you don’t see anything coming up, move the mulch away to warm up the ground a bit more. Once the shoots start coming up, push the mulch back around the plants. Mulch also helps with weed control and keeping moisture in the ground. You can water your garlic once a week if it’s a particularly dry year, but if your soil is well-mulched, you may not need to water your garlic at all – I’ve never done it. After June, do not water so the bulbs start to dry out gradually, once the leaves have stopped growing. Certain types of garlic form gorgeous, delicious, scapes. Snap them off once they’ve curled up to direct growing energy back into the plant’s bulb underground. 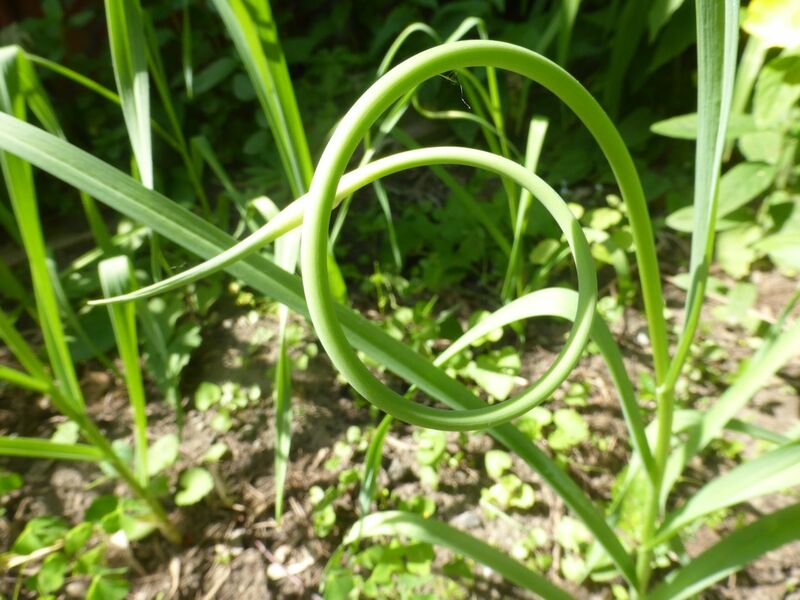 Garlic scapes are tasty in everything from omelettes to pesto. Store them loosely wrapped in a plastic bag in your fridge’s crisper drawer. Your garlic is ready to harvest when there are about 5-6 green leaves left on the plant. Each leaf corresponds to one layer of skin around the bulb. Don’t let all the leaves die down or you’ll be harvesting individual cloves and not bulbs. My garlic harvest usually takes place in late July or early August. Very carefully loosen the soil around each bulb with a small trowel or shovel. The garlic is extremely delicate at this stage and it’s super easy to damage a bulb when you’re pulling it out, so be careful with your fragile crop! Pull out each bulb, leaving on most of the dirt. Removing heavy chunks of clay is fine. Bring all your cloves inside, to a cool, dry, dark place where they will cure for a few weeks. The 2-3 week curing process ensures that each stem dries and closes completely, so you can store your garlic for many months afterwards. Lay out or hang up each plant in a way that air can circulate around it, so it dries evenly. I usually lay out my garlic in the basement, on a dryer rack sitting in a laundry basket, or some other type of makeshift structure. Don’t place it in direct sunlight. After a few weeks, take one plant and completely cut the stem about a few inches above the bulb. If the stem is completely white, with no green still showing, it means the garlic is cured and ready to store. Trim up the roots on each bulb (not too close of a shave!) and wipe off the dirt. You can also remove one or two layers of outer skin if you like. Once it’s cured, don’t ever wash the garlic or place it near water. 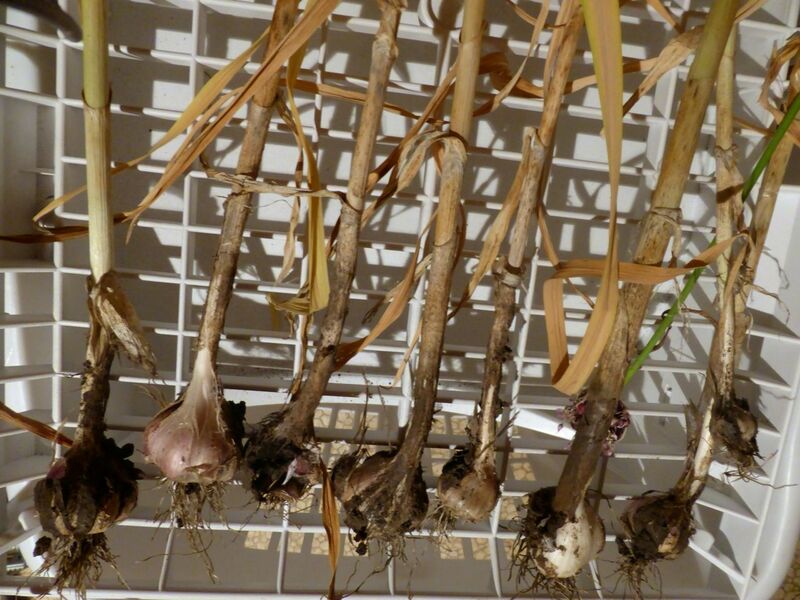 Your cured garlic should last 6-8 months in a cool, dark, dry place, depending on the type of garlic you’ve grown. If you find the willpower – I never have – save some of the bigger cloves to plant next year. I am so going to try this! The scapes in your pictures look beautiful. Scapes are definitely one of the best parts of growing garlic! They are delicious as well as photogenic. 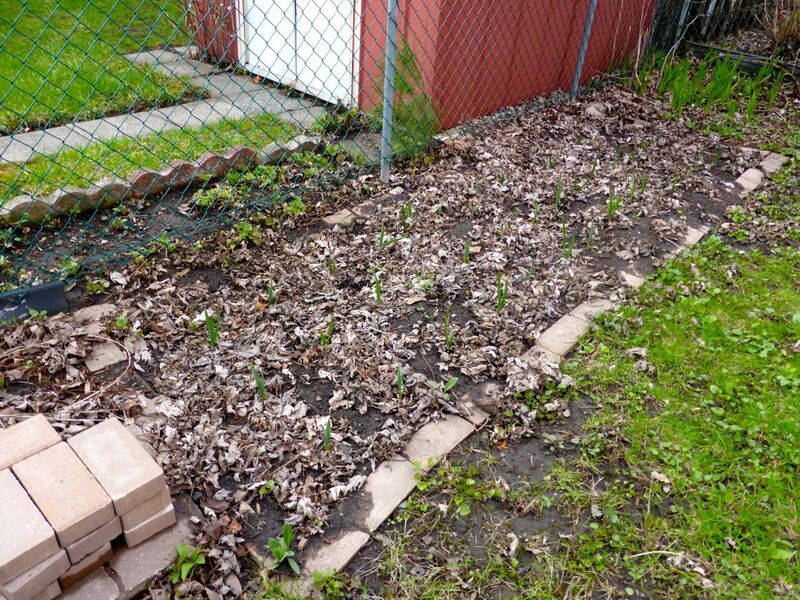 I like to garden a lot and I did plant garlic the last year too. It was a bit disappointing for me to find that teh bulbs were not a bigger size. But with your inputs I hope to get better ones this year. Thanks for a very informative blog! Also I did not know there were varieties in garlic too! I hope you have better luck with your garlic this year! I’ve been told that your bulbs will get bigger if you plant some of the larger cloves from the previous year. Will try out with larger cloves this time. Thanks again for the handy tips. Good Golly Gorgeous Garlic. Going Gaga! Great Gifted Gobs. Good Going!! A fanboy. All this almost makes me want to… buy some garlic? Lol, lazy me, but loved this piece!